“The Immigrant” is truly a Cinematic Masterpiece. I have not seen such a film in a long time. Not to mention Marion Cotillard who absolutely owns the role and steals every single scene she is in. America in the 1920`s. Ellis Island became a gateway for millions of immigrants to the United States. All of them out to pursue one goal: the American Dream. Ewa Cybulska (Marion Cottilard) and her sister, sick with tuberculosis, arrive at Ellis Island with no money. Once the officer notices that Magda might have a lung disease, he sends her to the hospital for 6 months. Soon after, at Ellis Island, the immigration officer checking Ewa’s files claims that the address she provides does not exist. In addition, the officer marks her as “a woman with low morals” because of an incident on the ship. Luckily, or rather unluckily, Bruno Weiss (Joaquin Phoenix), witnesses all of Ewa`s conversations with the officer, and offers his assistance. Soon after, Ewa finds herself in his “theater” where he offers any kind of woman to his clients. He introduces Ewa as Lady Liberty. The film “The Immigrant”, directed by James Gray, brings us right back to America`s 1920`s when hundreds of people left their homelands for a better life. With his indescribable cinematic vision, James Gray creates an absolute masterpiece; a world that tells us more than the film itself can say. The most beautiful thing in this film is a magnificent and tremendously convincing performance by Marion Cottilard and Joaquin Phoenix, which will surely raise them to a higher level. Ewa is desperate to get her sister out of the hospital. But in order to do that, she needs money. Where is she to get the money she needs if all she has is her little baggage? Bruno Weiss, being a very generous and kind man, offers Ewa a job in his theater. Finding herself in a hopeless situation, Ewa accepts his offer, without knowing all the details. I found one of the most powerful scenes in the film to be the one where one of Bruno`s clients asks him to help his son to become a man. Even though, we see that Bruno really cares about Ewa, he still asks her to use her body as the only way to get the money needed to help her sister. Ewa understands that her sister`s wellbeing is more important than hers, so she agrees, even though she does not want to. Ewa feels she has no right to make excuses since her sick sister is out there waiting for her. Change comes when Bruno`s cousin Emil (Jeremy Renner) enters the picture. He is immediately fascinated by Ewa`s beauty, and promises to help Ewa and her sister. And certainly, Emil wants to change Ewa`s life in a better way. The only thing that stands between Ewa’s reality and the happy life she may achieve, is Bruno, who is obsessed by Ewa and does not want her to go anywhere. Life would be much easier for Ewa if she had read Bruno`s real intentions from the beginning. But the reality she faced at Ellis Island was very serious and horrifying; this causes her to accept any kind of help from strangers. James Gray portrays Ewa as a victim. Her circumstances are horrible. Despite the fact that Ewa is a well-educated woman, the only job she can get in this new land is as a prostitute. Sometimes it is really very terrifying to see her attempt to try to justify her reality. By looking at her, you just cannot help but feel bad for her, as her situation is worse than anyone can imagine. An Iranian cinematographer, Darius Khondji, who is also known for his work on “Midnight in Paris”, “Panic Room” and “To Rome with Love” , did an absolutely amazing job creating the shabby variety theaters, the houses, the streets, to bring us back in time. Also, Christopher Spelman`s fine orchestral soundtrack complements the images of America in the 1920`s. It would be extremely hard to picture anyone else but Marion Cotillard playing Ewa. With her type of face and her unique beauty, she, most likely, was the first and the only choice for James Gray. I can see no one else except Marion portraying Ewa Cybilska. Joaquin Phoenix as Bruno Weiss is absolutely at his best. His character is an extremely tough, obsessed, and inexperienced villain. He falls deeply and madly in love with Ewa. Even though he tries to help her, at the same time, he does not want to stop using her and puts her in a difficult and dangerous situation. The money she brings him is more important to him than her happiness. 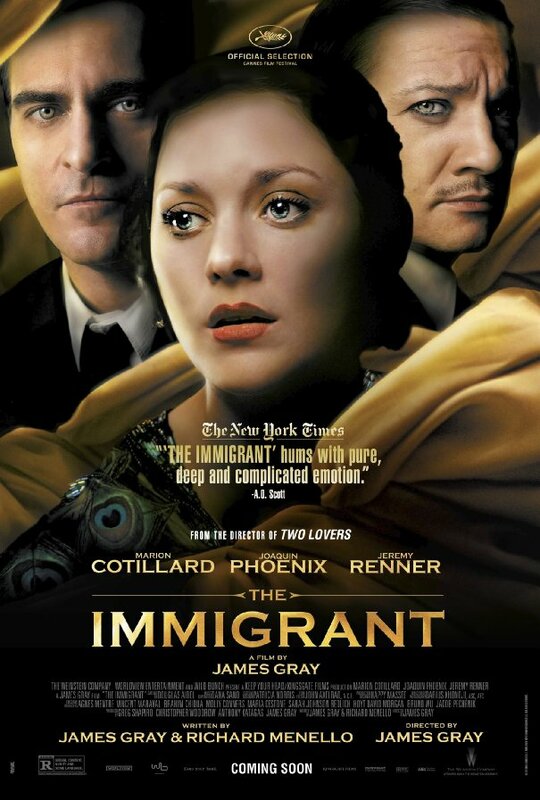 “The Immigrant” reminds me of “America, America” by Elia Kazan, and Michael Curtiz`s “Casablanca”. But in this film, Bruno Weiss is not Rick Blaine (Humphrey Bogart), and Ewa is not Ilsa Lund (Ingrid Bergman). By the end of the film we are supposed to hate Bruno for whatever he has done to Ewa, but all I feel towards him is a little empathy and compassion. “The Immigrant” is truly a Cinematic Masterpiece. I have not seen such a film in a long time. Not to mention Marion Cotillard who absolutely owns the role and steals every single scene she is in.